One day workshop on “UTM THESIS WORKSHOP – Writing & Formatting Thesis, Journal Article with LATEX”. 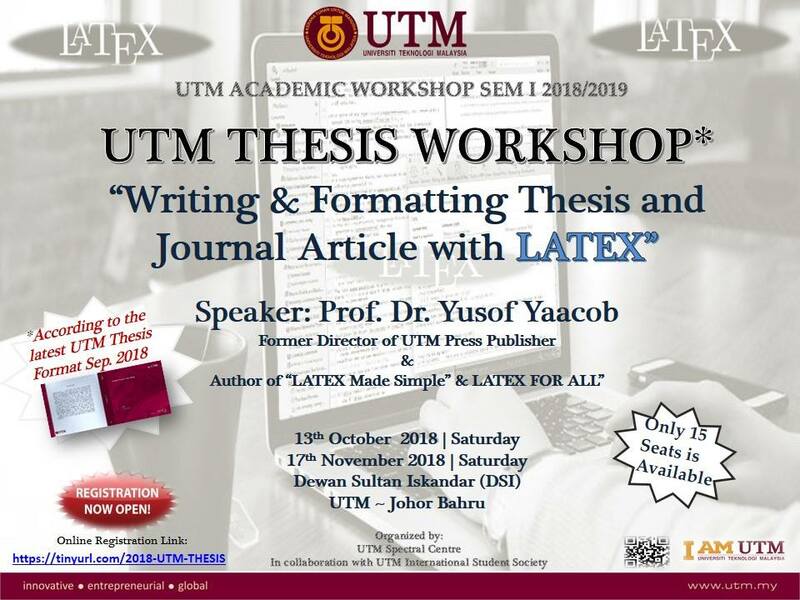 This workshop is to provide UTM students who rely on writing and preparing high quality thesis/project report according to the latest UTM Thesis Format Sep. 2018. The workshop will also focus on how to use LaTeX to write (typeset) a journal article for a good impact factor Journal. Prof. Dr. Yusof Yaacob is a Professor in UTM Faculty of Science and former Director of UTM Press. He received his Master of Science and Ph.D. in Mathematics from Ohio University, USA. He has published around 30 books and edited more than 100 Thesis and Article with Penerbit UTM Press. His latest book was awarded by the Malaysian National Book Award 2016 as the best book. Event categories: Students, UTM Calendar, and Workshop.